The following shows a minimalistic Prometheus example of instrumenting an application with multiple pod instances. We configure Prometheus to discover the pods of our config-example application. We need to adjust the app label (here config-example) and the port name (https) under which the monitoring endpoint is available. This example uses the MicroProfile Metrics endpoint that runs on top of Open Liberty. The application exposes the metrics in the Prometheus format under port 9443 and path /metrics/. You can find the full example including the running application on GitHub. 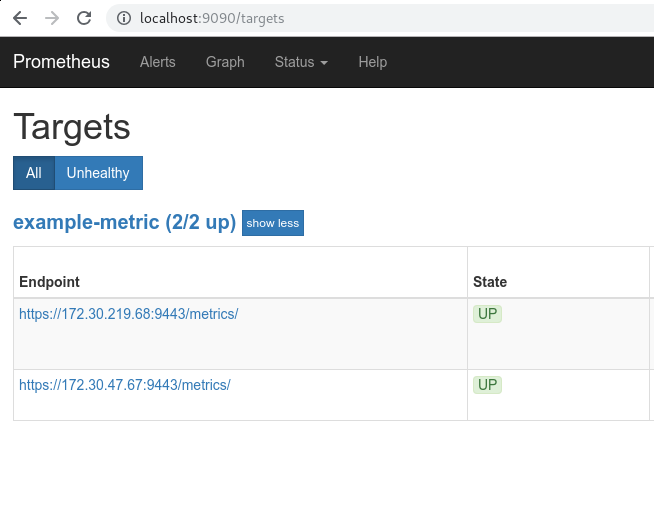 In order to make the example work for a RBAC Kubernetes setup, the Prometheus service account needs to have the correct permissions. Therefore, we create a service account and corresponding cluster roles as included in the YAML definitions here. Similarly, we specify the service account when creating the Prometheus deployment. We create a deployment and service for our Prometheus instance. The configuration shown earlier can be injected into the instance from a config map. For a full explanation on the Prometheus configuration, have a look at the documentation. We can see the actual targets including their IP address under the Prometheus configuration. Have a look at the full example on GitHub (deployment/ directory). You might also see the following video how to implement business metrics in Java EE applications using MicroProfile. For more complex microservice examples that define many more applications, this approach using the plain Prometheus configuration might be a bit cumbersome. To minimize boilerplate code, developers can use solutions that abstracts away the lower-level configuration, such as Prometheus Operator. In the next post we’ll see how Prometheus Operator facilitates the configuration of applications.